Before they read this Minute, ask your students what they know about Thomas Edison. Have they heard of him? What have they heard? Generate some adjectives they think might apply to an inventor and entrepreneur like Edison. Now read the Minute. I am guessing they are not familiar with this less savory side of Edison’s personality. Have them generate some adjectives to describe their new knowledge of Edison’s personality. Now transfer this awareness of additional perspectives to other characters - both fictional and real - that students know. Explore a historical figure that students only think of in a positive or negative light and have them look for other qualities that may defy a simplified description. Draw some conclusions! Author Whiting shares several very famous Edison quotes. Ask your students where they can find quotes. What quotes are they already familiar with? When is a good time to use a quote? How does it help your reader? When is is not a good idea? Have students begin looking for quotations in the things they are reading. Start a class collection of quotations. Design your own quotations! What makes something worth quoting? Is there a quote that would be worthy of hanging in your classroom? Host a quotation contest and find out! Edison was persistent and unafraid of failure. Who else can students find in history who benefited from these qualities? Find historical parallels and celebrate persistence in your classrooms. Thomas Edison would have been a huge fan of the STEM movement! 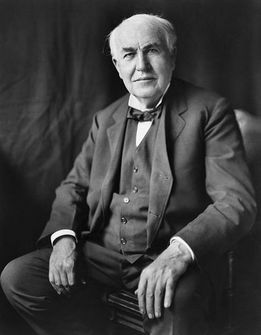 For loads of hands-on, Edison-based activities, check out the grade leveled list on the Learning Resources page at Rutger’s Thomas Edison Papers site. Scroll down to find the heading Science, Technology, Engineering & Mathematics Lessons. Ask your students to think about how music was experienced prior to the invention of the phonograph. What was required to share music listening with others? How could you llisten by yourself? Take a closer look at how this one invention turned the way the world listens to music upside down. The overwhelming quantity of resources available to learn more about Thomas Edison make hi a good topic for exploring purpose and audience in research. First have students generate a list of sites with information about Edison. Then see if they can evaluate the sites for things like intended audience, purpose, information included, information left out, currency, etc. Have them generate questions based on their reading of the Minute, then choose the sites best suited to find answers, while providing written justification for their choices, of course!